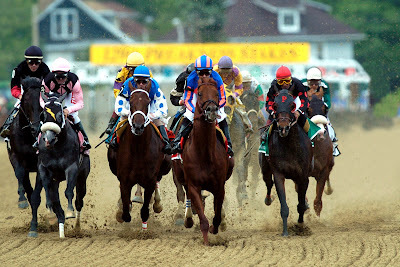 The Preakness is sponsored by the Maryland Jockey Club, the oldest professional sporting association in the country. It also serves as the face of Marylandhorse racing, the one day of the year when Pimlico’s turnstiles flap to capacity and her betting windows rake in the green. The Preakness is hand-painted Black-Eyed-Susans, the call of bugles, boisterous silk hats, the NavalAcademy chorus, network coverage, the Woodlawn Vase, and front-lawn parking at $25 a pop. It is run at ‘Old Hilltop,’ before a mixed crowd of upperly-crusted elite and beer-swilling sun worshippers. It is the hopes-and-dreams of owners and trainers, a national platform for state politicos, and the year’s top chance of being noticed for the who’s who crowd. It is beautiful women and dashing dudes, yellow summer dresses, white bucks and bow-ties, eagerly watching as the field of thoroughbreds loads into the starting gate. But mostly the Preakness is Baltimore’s annual opportunity to slip back to the days before the InnerHarborand Camden Yards, when steamboats and the B&O ruled the Bay and beyond. Simpler days, when the locals were more parochial than global, more cultured than course, and the second leg of racing’s Triple Crown was our cozy city’s chance to shine in the national spotlight.